A story of courage, of loyal animals, a loving grandmother, a death, a mourning, a secret inheritance, a dysfunctional family, a running away, a secret past, a mystery child, and most centrally, a young hero's journey into a far off country to find his true spiritual home. To find out more about Thiel please click here. For details of other forthcoming publications please visit our books page. 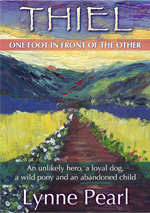 Particularly the epic genre of the hero and heroine who undertake a journey and on the way come across good and evil. Whether male, female, animal or human, they are together, helping one another seeking to find answers to questions both ancient and new. They step out of familiar surroundings into their own personal wilderness to find answers to eternal questions of progress, illness and escape. Sometimes answers are found alone, and sometimes together in a group. We are dedicated to providing a way, in the midst of many confusing ways, to move forward, to meet challenges whether singly or together, as an individual or as a family with self-help and how-to books with a sensitivity to meet your needs.We all have the common ground of humanity in our longing to belong. Whether placed in the landscape of Eastern Canada, the far Western tip of Britain, or the Southern tip of the Indian subcontinent, travel is found to have a voice through quick, sharp poems in the tradition of the haiku and Kerouac. Love of movement, written while on the move, seeing the beauty of landscape sitting in the cafés and beaches of the world.